12 Bars of Charity makes it's way to RICHMOND for the first time! The event is a friendly competition amongst 8 of the areas most popular charities, split up into teams, with the ultimate goal of having the most people signed up under their cause. 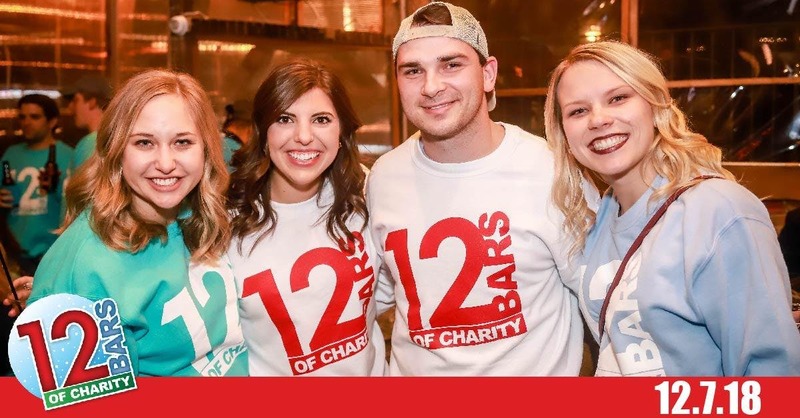 12 Bars of Charity is a great opportunity for you to round up your crew, support a local charity, and have one heck of a time out on the town! It's $30 to participate and you receive... - 12BOC SWEATSHIRT (each charity is a different color)- $10 donation to the charity of your choice. - FREE Shuttle Rides to take you to 12+ Bars- Ridiculous Drink Specials at All 12+ Bars- Experience the magical feeling that only the worlds most charitable bar crawl can give you! SIGN UP IN OCTOBER AND $15 GOES BACK TO THE CHARITY OF YOUR CHOICE! PARTICIPATING CHARITIES TEAMSAlzheimer's Association of Greater RichmondBig Brothers Big Sisters Richmond/Tri-Cities/Hampton Roads/VA PeninsulaChildren's Hospital of Richmond at VCUThe Leukemia & Lymphoma Society, Virginia ChapterRichmond Animal LeagueRonald McDonald House Charities of RichmondRichmond SPCAWorld Pediatric ProjectPARTICIPATING BARS TBA NOVEMBER 5TH!